YOUR HAPPINESS GUARANTEED with Beaming Baby Maxi Diapers! 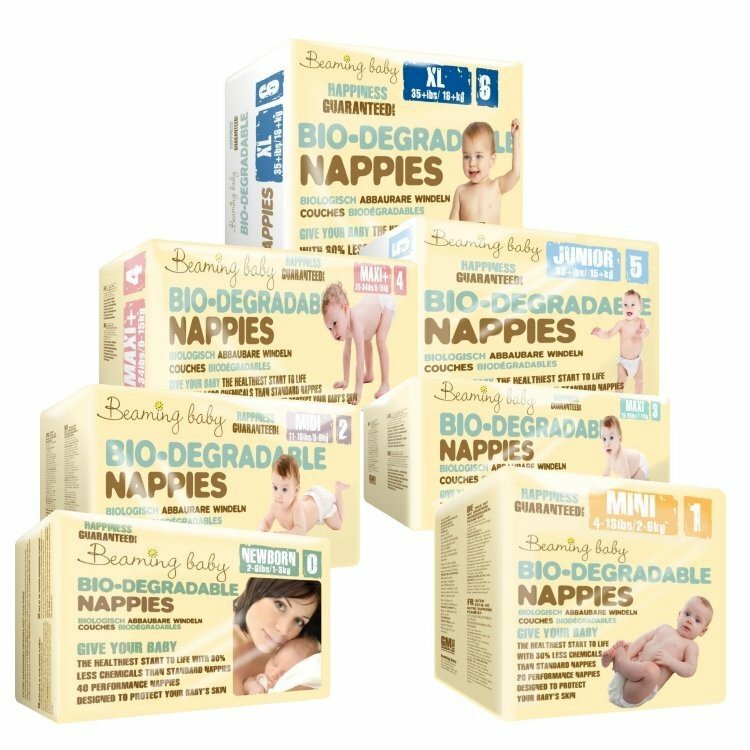 Beaming Baby Bio-Degradable Diapers Size 3 are Totally Chlorine Free and contain only Clean Plastics which are used in the Velcro patch and elasticated back and side panels. We have been using these since birth. Chosen because they are biodegradable and wanted to be more environmentally conscious without the hassle of washable diapers. We are 8 months in and still finding them brilliant, he has never had diaper rash. Service is also fantastic. They see our baby through the night, smell great and are enviro-friendly. I've been a total convert since a friend recommended them to me. Have been using these diapers since my son was born. He is now 9 months old and we have never had a case if diaper rash. Love these diapers and the fact that they are kind on the environment is brilliant. These are excellent diapers! They leak less than any other brand I've tried, they fit well, have a stretchy back panel (which minimises poo shooting up the back!) and don't smell of chemicals. Lovely company too!! Great customer service and overall ethos. Really impressed. Love these diapers and can't recommend them highly enough. I can literally say 'smooth as a baby's bum' about my son. Never ceases to amaze me how much these diapers can hold, especially the morning diaper that has been on 12 hours +. And I LOVE that they are friendlier to the environment. These diapers are great, easily do all through the night, no diaper rash, and so much better for the environment, so what's not to like! We use alongside our reusable diapers. The bio degradable options are effective, appropriately priced and better for our baby and environment. We couldn't be happier and will continue to use and recommend Beaming Baby. Since birth we use your diapers. Amazing! Wouldn't buy any other brand! Amazing company! Love everything from the product to the customer service wouldn't buy any other brand! Beaming baby diapers are great wish I had used them with first son from the beginning. Very absorbent, my first choice in diapers? Brilliant eco diapers. No leaks, keeps baby dry and are great for the environment. Easy to use website and order process. I've been using them for a few months now and I wanted to really try all situations before reviewing... Yes weaning has begun so that's a decision factor.. So here it is, they are fantastic! I chose BB as they not only put the babies skin as a priority but also consider the environment which I try to consider with any purchase. I've had no issues at all with my gorgeous daughters bottom! Let nature be the leader in your decision. Excellent customer service! Informative, helpful and speedy responding. We love your diapers! It is so good to have an environmentally friendly product that works. Very good prompt service. Product is especially good and nice to know we are wreaking a bit less damage to the environment. Marvellous!!! Can't praise them enough. These diapers are just what we were after. They are soft and comfortable for our baby to wear, as well as being absorbent, with the added bonus of being compostable so creating less waste. Good quality eco friendly, used from birth now 7 months and no sign of any diaper rash. These are brilliant diapers that work well. we have been using them since birth and my son is now 11 months. We are cloth diaper converts. However, our son is quite a heavy wetter & we have not been able to find a cloth diaper that will see him through the night so we had been using Bambos. I thought I would try these as their price & eco credentials do just pip the Bambo at the post. And...they are great! Have been using this brand of diaper since my daughter was born and she's now 7 months so we're up to size 3 now. Have always been impressed with the lack of leakage. Have also noticed they don't smell chemically like some more well known brands do. This is the 1st time I've used these diapers for my daughter who is 11 months. They are supportive and excellent non-leakage. Will carry on using them. I am happy to be able to buy the diapers across your web. The service that you give is unsurpassed. These diapers are brilliant, super absorbant and smell lovely. My baby has never had diaper rash and I love that they are kind to the environment. Amazing that a product with such an impressive environmental benefit is also miles better than the competition in terms of quality and performance. So good we had to order a delivery to our in laws abroad for our visit. Everyone I've spoken to at BB has been really friendly and helpful. Have been using these since my daughter was born (8 months ago) and have found them to be really good. Pretty much bomb proof. Wet proof even when I leave her in them too long (she is a second child!) and poo proof even when she does breastfed explosions! Recently forgot to order some so had to buy some emergency big name brand ones from supermarket and they smell really chemically and have leaked every time. Good family friendly service. Helpful over the phone. No toxins, biodegradable and effective, what more do you need? You guys to take over the market from Pampers! Best diapers out there. No nore rashes..
Really nice people. They showed they cared and even gave us a discount that we received shortly after purchase. I love them diapers because they are organic and natural! The nappies can't be rivalled! I am completely in love with BB eco diapers! Not only are they the best fitting diapers, they do the best job, preventing any leaks. As well as this, I know when I choose BB I'm doing the right thing for our planet and that makes me feel good.